Beta Blockers and COPD: Can Beta Blockers Help COPD Symptoms? Can Beta Blockers Help COPD Symptoms? Every day, millions of men and women use beta-blockers to help treat irregular heart rhythm, heart failure, high blood pressure, and other cardiovascular problems. 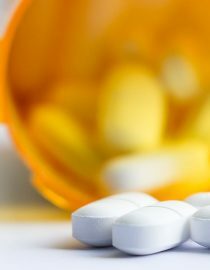 And because chronic obstructive pulmonary disease (COPD) puts additional strain on your heart and cardiovascular system, more and more doctors are proposing the use of beta blockers to help with COPD-related symptoms (such as high blood pressure and fast heart rates) and to protect your general heart health. If you have COPD, understanding how beta blockers work, and what effects of beta blockers and COPD may have, can help you ask your doctor the right questions and see if this category of medications may be beneficial to you. Beta blockers were first prescribed back in the 1960s, and today they’ve completely changed how doctors treat and prevent chest pain and other heart problems. On the outside of your cells are three types of beta receptors. On your heart cells, you’ll find beta-1 receptors. These receptors pick up chemical signals from your nervous system. As the receptors pick up these signals, the cells speed up your heart rate and constrict your blood vessels. Beta blocks, as their name implies, essentially attach to the beta receptors and prevent the receptors from picking up these chemical signals, thus lowering your blood pressure, slowing down the rate at which your heart beats, and opening up your blood vessels. Your doctor would know best which specific medication works best for you, depending on the exact specifics of your unique medical situation. Because beta receptors don’t just exist on your heart cells, it’s important to ensure any interference with these chemical signals don worsen your pre-existing COPD symptoms. COPD is the third cause of mortality in the world, and the medical community is often looking at ways to address this growing disease. When you talk about COPD with your friends, family or medical team, you likely focus on the many lung diseases that are caught under this umbrella classification. These include chronic asthma, emphysema, or chronic bronchitis. Besides the lung problems of COPD, most people with COPD also experience cardiovascular problems. This is a connection that some find surprising, as the two seem very different. For example, some of the same factors that raise your risks of COPD – including, but not limited to, systemic inflammation, genetic factors, aging, and smoking – are also linked with a higher rate of cardiovascular disease. And cardiovascular disease is often simultaneously present in those with COPD, with some medical experts estimating that as many as 52 percent of North American adults with COPD experience heart failure. Beta blockers have the most benefits for people who have both COPD and cardiovascular disease. Because the two often go hand in hand, beta blockers can help improve your overall health and quality of life. Even if you don’t have cardiovascular disease, beta blockers may still pose beneficial. Reduce the number of COPD “exacerbations” you have. Exacerbations is the medical term used to describe flare-ups or episodes where your breathing gets worse. Decrease the severity of COPD exacerbations, such as reducing wheezing and coughing, or minimizing the production of mucus in your lungs. Improve your oxygen levels. By reducing the oxygen demand placed on your heart, beta blockers may address a prominent COPD concern (lack of oxygen due to trouble breathing) and may even help you enjoy an increase in physical activity. Overall, some meta-analyses of different studies have noted that beta blockers may help reduce mortality in people with COPD by 28 percent, and may reduce COPD flare-ups or COPD episodes by 38 percent. On the one hand, beta receptors have been used and tested for decades, which can help your doctor regarding reducing your risks and side effects. But on the other hand, most people who take a beta blocker will experience at least one or more side effects. If you’re considering using beta blockers, especially concerning your COPD symptoms and episodes, your doctor will do a thorough review. Depending on the specific beta-blocker drug, some beta blockers have even been linked to shortness of breath, so knowing all potential outcomes can help you and your doctor to put together a plan that works best for you. We’ve compiled general and need-to-know information about COPD treatment. Here's what you need to know about these seven popular treatment options.